The Wheelabrator booth at CastExpo 2016 was proud to debut the latest hologram projector from Trade Show Holograms. This large scale 3d hologram projector uses the new ultra bright projection system for brighter holograms that can be seen from a farther distance, floating in mid air. The dual projection system also allows for different projections to be created on each side without interfering with the projection being created on the opposite side. Most exciting about the new display is the interactive touch pad which allows a viewer to choose between multiple holographic presentations on demand with the touch of a finger. The unique trade show exhibit was successful in drawing and keeping attention of visitors to trade show booth. 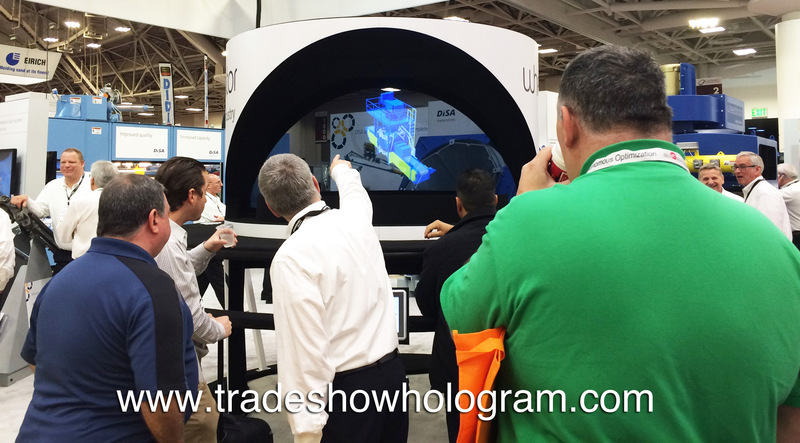 Hologram Projector – 3D Holograms float in mid air at trade shows, sales conferences ..etc. Trade Show Holograms is a holographic projection company offering clients the ability to feature products, power point presentations or virtual presenters in a 3D holographic form. The company offers 3D hologram projectors for both rental and sale and has been in the holographic effects business for over 7 years. Holographic images range in size from small to large and now very large! Holograms can now be as large as 20 ft wide and 6 ft high. The CEO of Trade Show Holograms explains that there are several methods used to create the 3D holographic effect. The company uses different methods in different staging situations to meet the clients needs. Most often the exhibit is used at trade shows across the USA and Canada but has become a popular display at press conferences and media events as well. Recent clients include Boeing, the US Army, US Air Force, The Detroit Tigers, China Unicom and General Electric. Hologram Projector projects a 3D holographic image. In todays busy trade show exhibiting market every booth featured at a trade show must compete for the attention of trade show attendees. 3D Hologram Projectors are an exciting and visual exhibit that draws attention to a booth or display. Holographic images range in size from very small to very large and are both offered as rentals or for sale across North America. The clients sales message or product floats in the air in 3D and can included full animation, color and audio. Holographic presentations run about 2 minutes in length on average but can be extended easily. A wide variety of shapes, sizes ( small to life sized ) and designs are available for trade shows, press conferences, sales meetings and corporate events across North America, USA and Canada. Illusionist Timothy Drake designed the unique trade show display and created Trade Show Holograms in 2006.